Cosplay | The Captain Britain fans' page and blog. 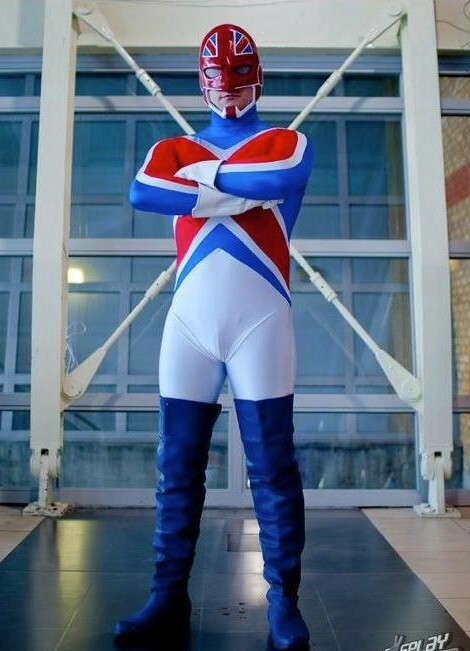 Suits you sir – Captain Britain cosplay. When I was a young lad I liked nothing better than to tie an old sheet round my shoulders and play ” dress-up ” as super heroes while running up and down the street. Today “dress-up ” goes by the name of cosplay and while the costumes are a lot more sophisticated at its hearts the desire to have fun and entertain remain the same as my old childhood games. What’s this got to do with Captain Britain I can hear you ask, well when I was doing research for topics for this blog I was curious to see if anyone had ever cosplayed as Captain Britain. So I Googled ” Captain Britain cosplay ,” thinking no one would ever want to dress up as the good Captain, boy was I wrong as a screen full of images presented themselves to me. After looking through all the examples I think the chap pictured below is by the far the best cosplay Captain Britain out there currently. Of course I was then curious to see if any cosplayers had ever taken up the role of any of Captain Britain’s supporting cast, yet again there were plenty of examples but this one of Meggan stuck out as a superb effort. Last but by no means least I found this excellent Betsy Braddock. So to all the Captain Britain cosplayers on this page and across the world-wide web a hearty well done.